Located on the highest street in the exclusive gated community of Sierra Blanca, this property benefits from one of the best panoramic sea views possible. With its South-Western orientation one has an imposing view towards Puerto Banús, Gibraltar and the African coast. 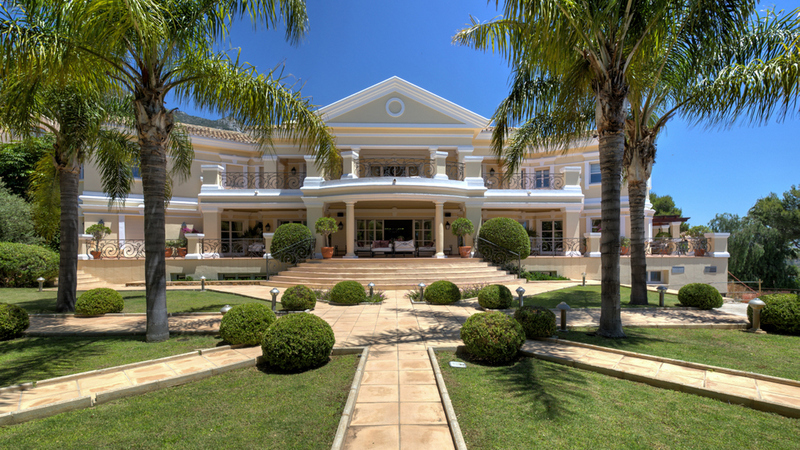 Upon entering through the grand entrance gate the property impresses with the highest qualities used throughout. 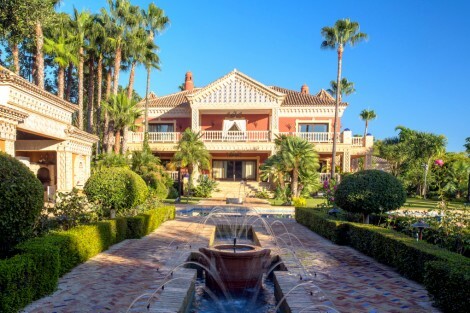 The villa has an impressive double height entrance hall with an imposing double staircase. Coming from the entrance hall one can find the main salon with a TV sitting area, dining table for 10 people and a separate marble chimney area beautifully decorated with marble columns. The open plan kitchen with a breakfast area is adjacent to the higher part of the salon. From the lower part there is direct access to the main terrace, the huge pool and the manicured garden with a cosy marble gazebo. Also on the main floor are 3 bedrooms en-suite, the guest toilette and the spacious equipped gym with beautiful sea views. Through an elevator all three levels of the villa are connected. On the upper level one can find the imposing master bedroom suite also beautifully decorated in rich roman décor. There are 2 more bedroom suites on this level together with the access to the rooftop terrace with the most amazing panoramic sea views. The lower level of the villa includes a heated indoor swimming pool, sauna, hammam, cinema room, air conditioned bodega and separate bar for perfect entertainment. The high qualities used include under-floor heating throughout, central A/C hot and cold, double glazed windows with Irocco wood finishing, heated indoor and outdoor pool, separate guest/staff apartment and a garage for 3 cars. Price reduced from €6.9M. to €6.4M. Please, send me more information about ref W-01H5H7, Villa in Sierra Blanca, Marbella Golden Mile or similar properties.